The Kanata Cup was filled with rhythmic gymnasts, from the youngest age division to the oldest, proudly performing their routines that took months of work. Nothing was different for the gymnasts in the Special Olympics division, who performed their routines on the floor, one or two skipping the immediate exit from the competition area to run over to the coach on the other side of the floor to get a quick high five or a hug for a job well done. The Kanata Cup has featured the special division for several years. It isn’t much trouble to incorporate the extra division said Kanata Rhythmic Sportive Gymnastics Club board member Cathy Smith. The Kanata club hosted the meet in Bridlewood on March 14 and 15. Ottawa Rhythmic Spirals parent and coach Maia Pudifin said it’s nice for the girls from the Special Olympics team to watch the routines in all the divisions. “It’s really the best because they learn by modelling,” she said. Pudifin’s daughter, Sophie Anne Lacourse-Pudifin, a national team member, is integrated into training with the mainstream gymnasts at her club. She trains with her mother, as well as Spirals head coach Xinhong Jin. Lacourse-Pudifin competed at nationals, and just missed winning the national title and qualifying for the world championships this year. 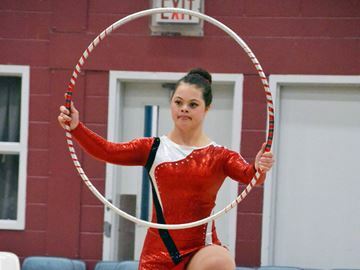 Two Kanata Cup gymnasts, also national team members, are preparing for the Special Olympics World Championships in the summer. They didn’t compete in the Special Olympics division, but instead were integrated later in the day with the other groups of competitors. Coach Bonnie Donovan, whose daughter Megan has been competing with the Rhythmic Cats club for 23 years, said it’s a good experience for the girls she coaches to see the competition. As it is for many sports clubs in Ottawa, meets often take place in Toronto and require a lot of travelling. But some of the Special Olympics athletes, who live in group homes, would have difficulty going to a competition in Toronto, Donovan said. The Rhythmic Cats train out of the Plante Recreation Centre. Her athletes competed at a variety of levels, but all finished their routines with wide grins on their faces. Donovan stood on the side of the mat during several performances to give cues to the movements for the routines. It was a successful event, and everyone was recognized with ribbons and medals to take home when the division wrapped up. A few minutes later, her own daughter grinned from ear to ear and gave double thumbs up as she skipped her way over to the podium to have a gold medal placed around her neck.